Strawweight prospects Polyana Viana and Hannah Cifers will be looking to rebound in Las Vegas. MMA Fightings Guilherme Cruz confirmed with sources that Viana and Cifers will fight at UFC 235 on March 2 at T-Mobile Arena following an initial report by ESPN. 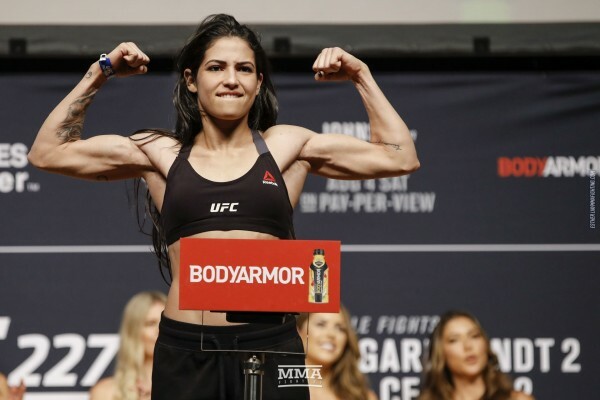 Viana (10-2) had a six-fight win streak snapped in August at UFC 227 when JJ Aldrich outworked her for three rounds to hand Viana a unanimous decision loss, the 27-year-old Brazilians first in the UFC. She debuted in the Octagon with a first-round submission of Maia Stevenson last February and has finished all of her pro victories. Viana also made headlines recently for dispatching a mugger.